The Academy’s design studio facilities are equipped to prepare you for a career as an Architectural professional. Our hands-on learning environment creates a culture that supports curiosity, investigation, and creative production. Online students engage in discussions and activities through the online platform, social media, and real-time streaming of our events. Faculty and peer relationships are reinforced to support collaborative learning. Both online and onsite environments are equipped to provide you with the skills you need to start a successful career in architecture. Our robotics lab explores emerging methods of representation and fabrication within architecture and design. As robot technology is rapidly advancing within architecture practice, we conduct hands-on research by design tied to the profession and potential building applications which innovate the field. Advanced digital fabrication equipment including laser cutters, 3D printers, and CNC routers are deeply embedded into our curriculum. Students learn to use these tools and apply them into their design process. The Academy of Art University is committed to continuously updating the physical production facilities of the school to accommodate the advancing field of architecture and the built environment. The metal shop expands students’ opportunities to realize their projects and explore the potentials of different material expression and technique. Students have the opportunity to learn a variety of metal fabrication processes. The large open atrium is literally the heart of our school, it is here where we conduct events, public lectures, and presentations of student work. 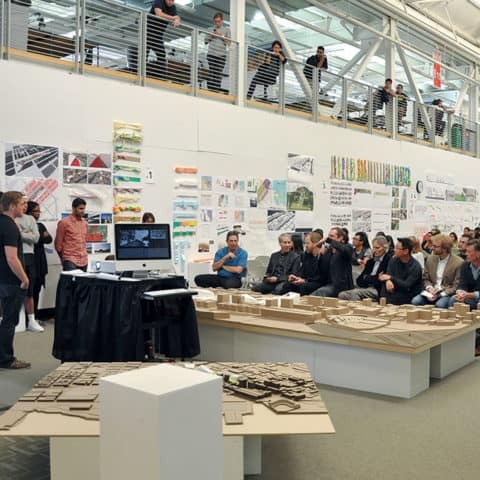 Both online and onsite studio environments in the architecture programs encourage public and transparent dialogue between students and faculty. Onsite students see quickly that the environment is one of open studio “classrooms” and presentation spaces. Online, students are engaged in discussion and activities through the online platform as well as social media and real time streaming of our events.